Art as the creation of something aesthetically pleasing has undergone many sea changes over the past century especially during eras of conflict and strife. Artists have used various methods to reflect that evolution and still produce something people want to experience—providing some kind of pleasure while not shying away from truths about the world. The works of Desarae Lee captivate with a turn-of-the-20th century look, including drawings with lots of cross-hatching and other technically accomplished details. 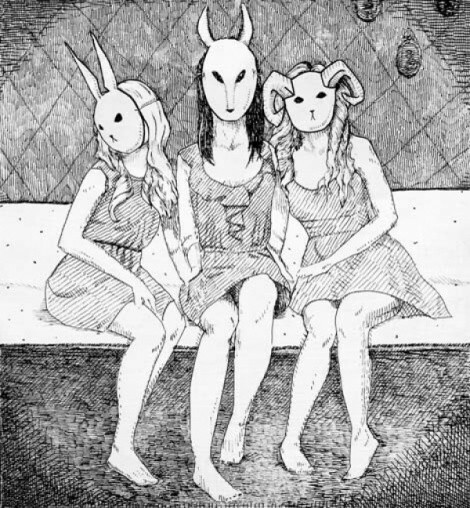 But they are also eerie: figures with animal masks (“Panel Four” is pictured), suggestions of death and an Edward Gorey influence that is also fun. Her current collection, she says, is a comment on human nature. The models in her photos aim for a quirky, natural look: “It serves as a mirror to see and accept our own imperfection.” Prints, photos and illustration showcase an artist who hasn’t been exposed much in the local gallery scene, and deserves more attention. The Avenues’ Cafe on 1st offers an open and ambient, yet cozy, site to view her works. The Cumbersome Dandelion and Other Works by Desarae Lee @ Cafe On 1st, 39 N. I Street, 801-532-8488, through March 30, free.